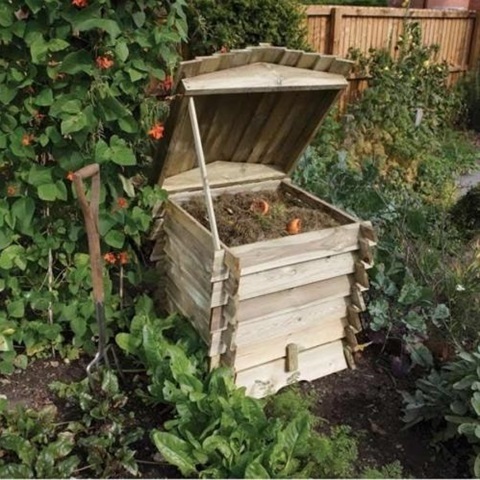 Wooden Beehive Composters as their name implies resemble a beehive and look more attractive in a small garden than a New Zealand or plastic bin. Due to the design and construction of the Beehive bin they tend to be a little more expensive than the simpler designs but offer good value for what is designed to be a garden feature rather than something to hide behind a trellis. This makes them ideal for the smaller garden or patio as they provide an attractive that can be positioned adjacent to flower beds or borders without aesthetically compromising the appearance of the garden. While most have a conventional wooden lid, it is possible to purchase bins with shingle or slate roofs. It is often said that Beehive bins are on the small side and that the and are unlikely to heat up sufficiently to kill potential pathogens but then they are designed for small modern gardens and cold composting over a period of months rather than hot composting requiring regular turning to produce compost in a matter of weeks. In fact, the capacity of beehive bins range from 211 litres to 438 litres comparing favourably with the entry model plastic bins available through council subsidised schemes (normally 220 and 330 litres). Prices vary considerably and it is worth searching for and comparing models for the best buy. It is helpful when making comparisons to check with the supplier as to the nominal capacity if only external sizes are given.